Some tips to take to heart to show your love to that important person in your life! 1.Know that marriage is like a long, slow walk together. More a marathon than a sprint. So just keep walking. Together. 2.Communicate confidence in who he is and what he’s about. So powerful in a man’s life. Your man needs to hear your cheers more than you might realize. And he probably needs to hear it louder and more often than might be evident. So speak words of belief and assurance that he has much to offer the world. 3.Throw a little surprise in there. Every-once-in-a-while. Just for fun. Spice it up with something unexpected. I love the look on his face when I do something out-of-the-ordinary that he didn’t see coming. Surprise! 4.Timing can make all the difference in the world. Discuss difficult things when you’re both rested – and fed. Often these simple things can determine whether the discussion will become a heated argument – or a profitable conversation. In the garage, the kitchen, the garden, or the barn. It’s always more fun with two. Find ways that you can join efforts to get things done. Help him out with his work, his chores, or Honey-do list. And then let him do the same for you. 6.Let him know what you need from him. It might not be as obvious as you think it is. It’s easy to assume that he is aware of what you need – and that he’s choosing to ignore you – but it could be that he is simply oblivious. So give him the chance to meet your needs by spelling it out, slowly and lovingly, what you’d like from him. 7.Differentiate what you need… from what you want. These two can be easily confused. But there is a difference – a big difference actually. Not that “wants” aren’t important, but they should come second to needs and are best kept in the “optional” category. 8.Welcome him into your world. Don’t keep him at a distance. Encourage him to be a part of what you’re doing and how you think. Make your world a warm, welcoming place for him to be. 9.Give up your need to be right. It’s not as bad as it sounds. Give it up and you’ll be glad you did. Being “right” is a highly overrated position. Don’t work it out on your own. We can forget that if we are believers in Christ, then we are not left to figure out our problems by ourselves, in our own strength. No, we have an all-powerful, all-knowing God in Whom we can turn. 11.Convince him that he’s the man of your dreams. And he’ll become that man. Elegant Sunflower Apron! Feminine and Beautiful! Fully lined, quality material, made with care and detail. Available here. Thank you! 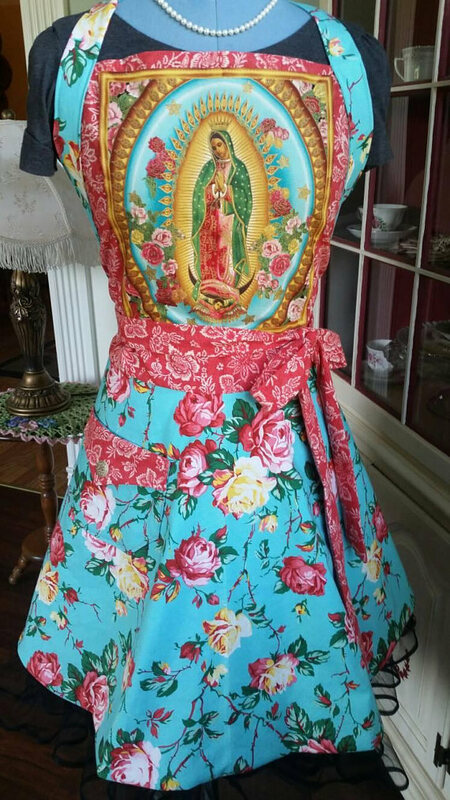 Lovely apron, is it again a material found online somewhere? I don’t think I have seen it anywhere ….. The sunflowers look so realistic!